A few days ago, I received a message from a friend of mine totally freaked out by registrations for the upcoming trimester. ESSEC offers its hospitality management students an extensive range of electives to supplement the required fundamental courses, allowing us to customize our program to acquire the skills and competencies we need to accelerate our future careers. Therefore, every trimester, students face the agonizing ritual of contacting previous students to get advice about individual classes and building their personalized schedule. At that point, my friend’s dilemma was to select between a class called “Snapshot, hotel demand management” or to take something completely different. The cause of his apprehension was an email sent by Snapshot’s lecturer, highlighting the words “intensive boot camp” half a dozen times and barely hiding (and in fact highlighting) that it will be a tough week. As he knew that I had taken this class the previous year, he reached out to me to have my feedback. A few hours later, with a couple of beers on the table, we started to discuss my previous experience in this demand management boot camp. I started our discussion by confirming that the class is demanding, but that’s the point of a boot camp: No pain, No gain! And talking about gain, I asked him what he was expecting. “Don’t know exactly, but the name sounds good and many people said that it was a great class”. What can I add to that…? All the user feedback was positive! To better understand the class, I should start by saying that it’s a class designed by professionals for professionals. This might seem meaningless, but you should remember that in hospitality, there is often a big gap between people in operations and those in the corporate office. The lack of a mutual understanding between people in sales vs. revenue management; between management vs. front of house; or between headquarters vs. the property often leads to a lack of alignment in term of strategy. Thus, having people who truly understand operations create a class like this helps brings clarity and understanding to many of the challenges being faced by hotels today. Snapshot is a company founded a few years ago by hoteliers who wanted to facilitate the centralization and interpretation of data in hospitality to enable the managers to focus less on trying to find the right figures and more on actually growing revenues. Later, realizing the great knowledge gap that existed, they created a department in charge of education, which mission is to take participants through the basics of a more holistic approach to hotel management and revenue management. Thus the hotel demand management boot camp was born. Planned over five days, during the boot camp you study all the topics that help a manager to drive more value out of a hotel: Revenue Management, Marketing, Distribution and E-commerce and finally, Asset management. That being said, my friend made a good point, which is that we already have all these classes at ESSEC. So why should he take them again? Well, just because it’s always beneficial to review those topics with a fresh look. Plus, since these help to drive demand, each of them impacts the others and it’s important to link them together around a common example. For example, Revenue Management classes typically focus on selling the right room at the right price to the right customer. However, few revenue management classes focus on which channel is most economical to acquire that customer, something a distribution class will typically do, but the latter in turn fail to explain how to optimally price the room. During the boot camp lectures build on previous knowledge to strengthen participants’ understanding not just of each discipline but to highlight the importance of considering each of these aspects holistically as a future manager. In addition, the boot camp classes are not like regular lectures, as a wide variety of knowledgeable guest speakers also gave highly interactive presentations, discussing real-life example and sharing great anecdotes. For example, we had the chance to meet David Turnbull, the co-creator of Snapshot, who gave us a lecture on distribution, and Martin Soler, consultant in marketing and former General Manager, who discussed concrete cases on which he had previously worked. Hearing this my friend started to worry, because he had previously a class given by various guest speakers, and many of them repeated and overlapped with each other. To avoid that, a facilitator stays all week to coordinate both the speakers and the content. This helps the guest speakers to concentrate on delivering their personal core message as they do not have to re-do introductory material each and every time they start a class. This greatly enhances the attractiveness of their presentations, which was much appreciated by the participants. Lastly the boot camp adopts a “hands-on” approach as you are doing a real-life case study in groups, where you are given a hotel with competitor, financial and occupancy data. It is because of this that the boot camp notion all makes sense because, although it’s interesting, it’s very demanding: market trends study, competitive analysis, review scanning on TripAdvisor, income statement analysis… you certainly never have the time to get bored! Soon, you discover that your hotel faces several issues, including a low average daily rate, a less than perfect rating on the social platforms, an unbalanced business mix and inefficient marketing campaigns. The idea is to work as if you were the general manager to try increase both the earnings and the value of our hotel. On the last day, you present your action plan which is analyzed by all the guest speakers you met during the week. What a great jury! And great thing: the class doesn’t stop here, and you get a detailed feedback on your project a few days later. At that time, our beers were empty, and my friend more than motivated. A couple weeks later, I happened to see him and asked about his reaction to the class. “You were right, it was very instructive. The guest speakers and the projects are very interesting, and it makes a great recap of our two years. I’ll definitely recommend it too!” Told you! 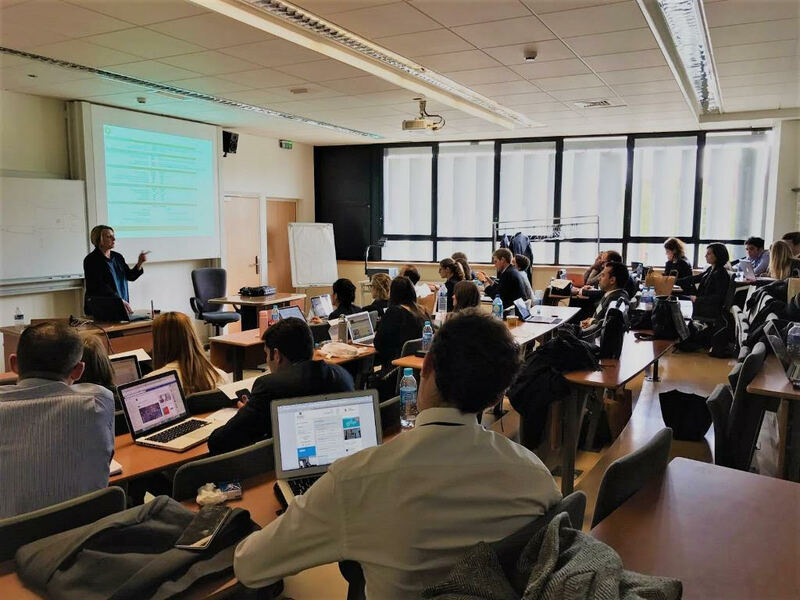 In April, Hospitality Management students at ESSEC received an email from the school’s administration telling them that 2 students would have the opportunity to represent the school by participating in the HEDNA conferences in Dublin in June. I had a deeper look at the conference website and got very excited: the conferences as well as companies represented seemed very appealing to me. You might be asking yourself, what is HEDNA? “ Founded in 1991, HEDNA (Hotel Electronic Distribution Network Association) is the only global forum exclusively dedicated to the advancement of hospitality distribution through strategic collaboration and knowledge sharing. “ Their members are hospitality industry leaders and innovators from all over the world: all areas of electronic distribution including hotels, representation and management companies, GDSs (Global Distribution Systems), OTAs (Online Travel Agencies), tour operators, software and payment service providers, industry consultants, and educational institutions. Besides working groups, white papers and educational opportunities, the HEDNA association organizes two major events annually, one in the United States and the other in Europe. Electronic distribution has been an increasing interest for me since I began the program, as I understood how distribution is fundamental to an hotelier's success. From basically finding a way to sell a room night to dealing with security payment, interfaces, privacy, CRM (Customer Relationship Management), revenue management, data collection, content, SEO (Search Engine Optimization), mobile … it is rather complex! I have had the opportunity to be introduced to these concepts at Prof. Peter O’Connor's famous E-Commerce course in the IMHI program, other courses of digital marketing and during conferences (Christopher Michaud, Expedia) which triggered my interest; I wanted to go deeper on the subject! I applied and 2 months later, here I was at the Dublin airport on a fresh Monday morning with my teammate: Thomas Amet, IMHI student also an IMHI student. The event began on Monday evening with a welcome drink, which allowed us some time to enjoy a nice walk around Dublin city center and get ready for 3 intensive days. We were welcomed at The Croke Park Hotel. The first day focused on HEDNA University courses and working groups, the second day consisted largely of conferences, and the third day was a global wrap-up and next steps focus. At that time, we met the Dublin HEDNA organizers who introduced us to HEDNA board members including Sarah Fults, current HEDNA President and VP Distribution, MGM Resorts International. It was then time to meet all the attendees (over 250 professionals) with a first welcome drink and a perfect occasion to start networking. At such events, networking is extremely important. In fact, the association hopes that members will be able to help each other, get to know what’s new in each company and exchange best practices. During the networking, we had the chance to exchange views with and learn from very knowledgeable professionals such as Christian Meissner (Director of E-Distribution of Deutsche Hospitality), Sylvain Courtial (Senior Manager, Hotel Connectivity & Content, Amadeus) and many others. The conference started on early Tuesday morning in the impressive Croke Park Center. We were first briefed by the organization team: our job would be to distribute microphones at the end of each conference for the Q&A session, which would thus allow us to attend all the conferences and network with conference participants. The first day was filled with content from HEDNA University offering two courses throughout the day: an “Introduction to Distribution” and a more advanced level course on "Delving into Distribution”. Besides the University courses, a large panel of working groups was organized. As I already had some knowledge of the topics delivered by the HEDNA University during IMHI classes, I decided to participate in a few working groups, such as the Hotel Analytics Working Group session. This new group is led by Matthew Goulden (Managing Director, Triometric) and David Turnbull (Co-Founder and Chief Commercial Officer, Snapshot). Its objective is to increase awareness and adoption of data analytic practices and tools and demonstrate how data analytics can be applied to hotel distribution. In this first session, we discussed some key aspects to focus on as follows: the cost of distribution, the market trends, some distribution supply insight, the operational performance, the data management. The afternoon went on with a few other working groups including a great panel on OTAs and Emerging Models topic where Carlo Olejniczak (Director, Global Chains, Booking.com) Omar Farrugia (Director of Sales - Online, Corinthia Hotels), Adrian Hands (Senior Sales Director, Enterprise Accounts EMEA, TripAdvisor) and Daniel Holl (Head of Global Hotel Sales, Trivago) discussed the OTA’s value proposition in the evolving hospitality landscape. The second day started with a nice Irish breakfast for a good refill before another intensive day. Before going into the distribution subjects, Kevin Kelly, international speaker and author of the book: The Pursuit of Xceptional Execution, gave a motivational speech highlighting what makes exceptional businesses and their leaders succeed. Then we alternated between individual conferences and panel talks on several topics such as: - A State of the Industry done by Jerome Wise, Vice President - Enterprise Clients, TravelClick - Innov8 where 8 key professionals shared their innovations in our industry in an 8-minute pitch - Artificial Intelligence, Chatbots, and Virtual Reality: How to use technology to engage with consumers in which Alex Gibson, one of our Senior Lecturers at IMHI, also spoke. Finally, we had the opportunity to learn how to pour a Guinness during the concluding event held at the Guinness factory house in Dublin with an amazing view of Dublin. After a final wrap up, it was already time to leave! We were flying back to Paris having forged many new professional connections, new knowledge, various insights and a great way to concretize our career. Since then, we have continued to follow up on some of the working groups and are still involved in the analytics group. We would like to thank IMHI for the opportunity to take part in this conference and the HEDNA organizing and board teams, who were very friendly, didn’t hesitate to introduce us to other professionals and gave us some good tips for our future careers! From a student's perspective, the HEDNA conference was a great occasion to meet with numerous professionals, wider our knowledge and gain valuable insights of the Hospitality distribution sector. By: Victoria Estic, ESSEC student. Every year, ESSEC Business School hosts an industry conference focused on topical strategic issues affecting the hospitality sector on its campus in Cergy Pontoise near Paris.This brings students from both of its Hospitality Management programs (the MSc in Hospitality Management and ESSEC’s Global MBA major in Hospitality Management) together with alumni and industry partners to discuss issues, challenges, and trends facing the industry today, giving them the opportunity to interact with senior industry executives as well as advance on their job search for after graduation. This year ESSEC jointly organized this forum with the Mastère Spécialisé Management International Agro-alimentaire (MIA), further expanding participant's horizons away from traditional hospitality and opening their minds towards opportunities in the broader food production, distribution and retailing areas. The forum kicked off with two industry panels focused on two key interconnected industry issues –developing business models and innovation. The first panel, entitled ‘Excellence in Business Models’ was moderated by Professor Peter O’Connor and included speakers from a very wide spectrum of hospitality companies including Trivago, Squarebreak, Touch & PLAY, Deutsche Hospitality and SnapShot. The discussion started by highlighting how the business model behind traditional hospitality companies is increasingly coming under threat, whether from innovative players such as AirBnB or online companies such as the OTAs, both of whom are radically changing paradigms as what it means to be successful. According to Laurent Michaud (IMHI 2011), CEO of Eazeat, today hotels are struggling to drive additional revenues. Currently accommodation make up four-fifths of overall revenues, but this figure is relatively fixed and if hotels wish to keep growing, they need to find supplemental revenues from somewhere else. Some companies are moving ahead – for example Accorhotels with its innovative ‘Local’ initiative, Deutsche Hospitality by moving away from the company’s traditional markets with its new concept Jaz, and Squarebreak by combining private rentals with hotel-like services while also innovatively responding to a growing demand for both privacy and unique experiences. The biggest challenge most hospitality companies currently face is this one of managing change. Which is why perhaps they should consider trying to collaborate more closely with start-ups like Snapshot or Eazeat, whose smaller size and nimbler organization structure allows them to react to developing market opportunities much more quickly. As David Turnbull (Co-Founder & CCO of Snapshot) pointed out, the hospitality industry should start investing in technology and data to better understand customers and satisfy their developing needs. The PMS can be used to store information, the CRM to offer personalized services and the channel manager for online distribution. Then, the staff should be trained to use the data and be proactive. The second panel returned to this topic of innovation. Speakers such as Régis Bertrand, Innovation Manager at Metro and Laurent Repelin, General Manager Food Service and B2B at Savencia, highlighted the role of having the right people in the innovation process. Thus, creating an environment that fosters innovation is essential. Thinking differently about this business is one of the key issues, which perhaps helps explain why having a shadow Comex composed of Millennial has become a growing trend in companies struggling to keep ahead of the game. As Craig Cochrane, Senior Vice President Human Resources Movenpick pointed out, hotels do not always have the internal resources to innovate for themselves, but can use startups to better understand the customer and respond faster to their needs through social media, the web and media such as mobile. In the food industry, innovation also means finding the proper tools to respond to both individual needs and more macro trends to insure that the company can deliver the right product to the right user at the right time. For example, restaurants could make better use of CRM to better understand customer habits. From this communications channels such as social media could be used to better market to the customer, thus helping to increase turnover. Irrespective of the industry, the key issue is understanding the customer to know what products he is looking for and how much he is willing to pay. In Berlin, Metro is launching an accelerator where solutions are tested for free by customers to make sure that the digital promise matches real life requirements. And companies should also keep in mind that although some innovations can be considered global issues, others need to be tackled locally to better service regional needs. After the round tables, the afternoon was dedicated to meetings with partner companies. Participants included AccorHotels, Booking.com, Carlson Wagonlit Travel, Citizen M, Colisée, Compass Group, Deutsche Hospitality, Domitys, Dorchester Collection, Four Seasons Hotels and Resorts, Oetker Collection, Marriot, Hosco, Savencia Fromage & Dairy, Metro, Movenpick, Trivago, The Ascott Limited, Paris Inn Group and EliorGroup, providing participants with the perfect opportunity to talk with senior industry leaders and start finding jobs and internships. The event highlights the close connection between industry and the school – an important consideration given the latter’s orientation to provide practical, applied and relevant educational opportunities for its participants. Thank you to all the industry executives who made this possible for your continued commitment to preparing the next generation of hospitality leaders. Diversity is highly valued in ESSEC’s Global MBA major in Hospitality Management (IMHI), and this quality is reflected not just in its orientation and its student body, but also in the composition of its teaching staff. As befits one of the leading schools producing graduates for the global hospitality sector, ESSEC’s hospitality faculty not only have widely different educational and professional backgrounds but also hail from every corner of the globe. Here we take a look at four really great teachers that truly represent the spirit of the IMHI program. The first is of course Professor Peter O’Connor, Academic Director of the program and the one who teaches both the Business Computing and the eCommerce courses. Coming from Ireland, Peter has a deep connection with the hospitality sector. While he holds a PhD from Margaret University College in Edinburgh and has authored both textbooks and countless articles, his true value is his expertise on using electronic channels of distribution in hospitality, as well as on how technology can be used to enhance operational effectiveness in hotels. Peter is greatly appreciated amongst his students. He is not only passionate about his subject but can communicate and pass this onto his students in only one class! A talented speaker, he is a strong believer in “action learning” and “learning by doing”. While difficult, and often frustrating, for some, by forcing participants to think for themselves, experiment and find creative solutions, this quickly produces deeper learning that traditional methods. “Instead of immediately revealing the ‘right’ solution, by trying over and over people finally succeed and understand much better what they’ve done”. Perhaps the best reflection of this approach is the high level of technology literacy amongst graduates of the program, a competency much appreciated by employers. A second teacher who has had an enormous influence of generations of IMHI students is Professor Robert E. Kastner, nicknamed Bob, who comes from America and teaches Financial Accounting. After completing his studies, Bob taught at Cornell on the faculty of the School of Hotel Administration. He is widely known as a lecturer and producer of management development programs for the global hospitality sector. He has had a long association with leading international hospitality management companies, and also works with Robert M. Chase & Associates to deliver executive education programs using two management simulations, the Cornell Hotel and Restaurant Administration Simulation Exercise. Bob’s highly dynamic nature, enthusiasm, and ethic nature represent well his American genes. Bob is an excellent teacher who pushes students to work hard and excel at what they are doing, with the result that, during their careers, graduates think back about Bob’s financial accounting classes & methods. His key battle cry is “cash-flow”! Everything invariably has to do with “cash-flow”, the lifeblood that makes a company run well. Behind his serious manner, Bob is a very nice and funny teacher. Students will never forget Bob and his countless hilarious ties! He is a truly passionate teacher who definitely doesn’t leave students indifferent. Adding further to the international dimension is Revenue Management specialist Dr. Sunmee Choi from South Korea. Another Cornell graduate, she teaches courses on quantitative analysis and decision modeling, particularly applied to the Revenue management area. Before joining the academic world, she worked in several interesting industry positions, including Director of Hotel Revenue Management at priceline.com, as well as in operations for companies such as Hyatt, Hampton Inns, and Sheraton. Sunmee is an amazing teacher who clearly knows her highly technical subject inside-out. She is passionate about research and provides students unique academic articles to read and analyze. Rather the simply teaching classes, she encourages students to dig deeply into research and innovation. Her way of teaching, which is very methodical and thus very different from Professor O’Connor’s more unstructured approach, represents well her South-Korean roots and thus confronts students with the perfect opportunity to learn about different ways of working. Despite her highly quantitative discipline, Sunmee is at heart very soft as well as genuine and as a result the students love her. And last but not least we have global traveller, Dr. Stefan Groschl, an ESSEC faculty member specialized in Human Resources Management, educated in the UK, based in France but originally from Germany and now living in Panama! Stefan is Co-Chair of the ESSEC Leadership and Diversity Chair and Member of the Faculty of Management at ESSEC Business School. A graduate of Oxford Brookes University, Stefan has both worked in the hotel industry and taught in academic positions in England and Canada before joining ESSEC. He is a regular panelist and speaker at academic conferences and industry events all over the world as well as delivering courses at numerous academic institutions in Mexico, Taiwan, Spain, New Zealand, Germany and Bahrain – a truly international profile. Stefan is an excellent teacher and even though his subject – Human Resources – was not necessarily the one that students were initially the most excited about, he consistency manages to make it as one of the students’ favorite classes. Indeed, one of his classes “Managing Oneself and Leading Others” goes much further than just teaching basic human resources management. It enables students to work and reflect on their own personal growth. Stefan also succeeds in prove to students that Human Resources is at the center of success in most companies, but particularly in the people oriented hospitality sector. His rigor, as well as his proximity to students, are greatly appreciated, and his ability to help people understand that hospitality is above all a people business adds an important dimension to the IMHI experience. 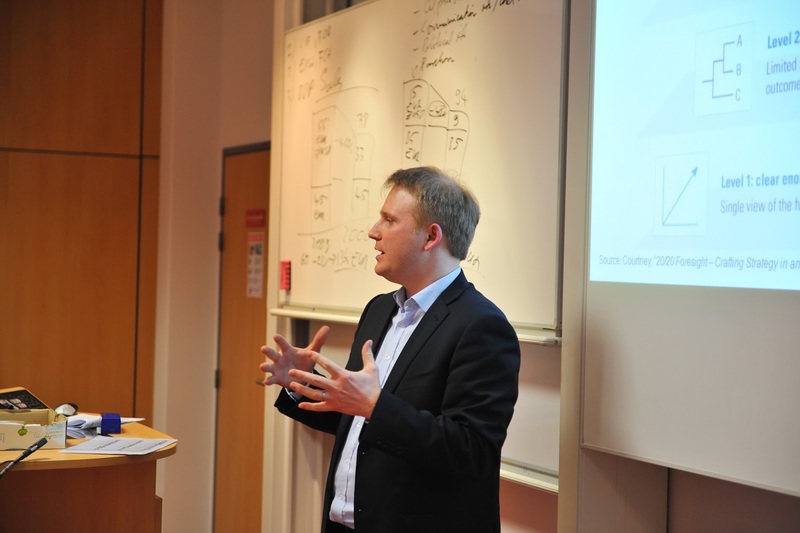 Thus, from Ireland, to America, to South Korea and Germany, and many destinations in between, almost the entire globe is covered by the ESSEC faculty. To that we add the students, who typically come from nearly twenty different countries, the orientation which focuses on the global hotels sector and it all adds up to a truly international experience. Such a variety of intertwined cultures presents students with a unique opportunity from which to adapt and learn, and in fact experience what most of us actually experience when we’re hired in different positions in global companies in different parts of the world. ESSEC’s Global MBA major in Hospitality Management – offering a truly international education to help prepare you for a truly international career! HEDNA's European Global Distribution Conference held in Berlin from June 14-16, 2016.
representing ESSEC at HEDNA's European Global Distribution Conference in Berlin, Jessica and I took the responsibility seriously – preparing and trying to give out our best in order to make our institution proud. HEDNA (Hotel Electronic Distribution Network Association) is the only global forum exclusively dedicated to the advancement of hospitality distribution through strategic collaboration and knowledge sharing. For over 25 years, the non-for-profit association has provided members with networking platforms, educational opportunities and professional resources to help them navigate the ever-evolving landscape of hotel electronic distribution. For a soon graduated MBA in hospitality this was a wonderful opportunity to learn about the latest trends in the industry, to get a better grasp of the on hands on experience, and finally assess how ready we were in our turn – for the beginning of our new careers. During the 3 day conference, we got to listen to some of the biggest names in the industry, participate in different workshops and even engage in hallway conversations with these experts. We were pleasantly surprised to conclude that our MBA program prepared us well in order to understand and contribute to solving the main challenges the hotels are facing today. "Jonathan’s inspiring speech inspired a deeper understanding of the hotel industry's challenges and opportunities"
We were again reassured just as it was a Peter O’Conor’s e-commerce class that emerging consumer and industry technologies, guest expectations, business strategies, market forces, and organization strategies create a compelling and essential need for hotel distribution to continue to evolve and transform. HEDNA's own research presented a compelling vision into the future of hotel distribution presenting us with the various factors driving the need of change as well as discussing optimal solutions. Among some of the greatest speakers we were honored to attend was also Jonathan MacDonald - a world-renowned speaker that provided thinking, new perspectives and avenues of thought for companies such as Google, Apple, P&G, Unilever, Nestlé and IKEA. Jonathan’s inspiring speech inspired a deeper understanding of the hotel industry's challenges and opportunities and enabled hoteliers to utilize knowledge to explore what the future could look like, and whether they are building the future hotel industry as the one they want to live in. The conference was concluded by another wonderful motivational speaker – Jim Pickell also founder and CEO of HomeExchange that discussed innovation, disruptive technology, and data and how these aspects are already removing traditional barriers and friction points in reshaping and delivering a better hospitality and travel experience. Especially valuable I found the opportunity to network with other professionals, which is an exceptional chance for our professional development and horizontal exchange of experience. We got the chance to meet professionals from all areas of electronic distribution including hotels, representation and management companies, GDSs, switch companies, OTAs, tour operators, software and payment service providers, industry consultants and educational institutions. As I am looking to build a career in digital marketing, attending Hedna conference and gathering valuable industry insights had a significant contribution to my future professional expertise. I feel beyond lucky to have had the opportunity to attend this event along with professionals from all over the World. The ESSEC MSc in Hospitality Management is the leading center of hospitality education in Europe. Follow the students' journey throughout the year on this blog!